I apologize for the lack of attention to this blog. I swear its not because I've lost interest or have gotten lazy (well maybe a little bit of that) it's because I have been moving for the past 3 days. Loading the theater set up into storage has been heart breaking but the truth is the last location sucked, like how the room had a ton of things stored in it (not mine), lots of dust, and mildew. Still it had a lot of good things going for it, like very little traffic outside, neighbors that never complained, and the room was located far enough from the bedrooms to not be a bother. I don't for a second doubt I will find someplace better though, so I'll tough it out. I also am working on getting a temporary set up going to continue screening and reviewing films. Oh and I will be opening up 4 more review spots due to the interest the original 8 have generated (A run down of the review system and my ideas behind it will be posted soon). This post marks the return or regular posting, so start checking again! Also I have reviews I've saved and I will continue to post what the citizens thought of the films I screened. 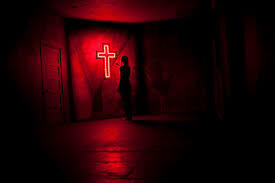 Oh and on a side note, I just watch "Lords of Salem" and I loved it. It felt like Rob Zombie channeled Polanski and Kubrick for this one and I have to say it is my favorite film of his yet! And not just because it had an obvious black metal under tone to it. Anyway I look forward to actively posting again, so stay tuned!